'Over the past two years, the international success of La vie est belle has spoken volumes. After an exceptional launch, the Eau de Parfum won women's hearts by opening up brand new perspectives: happiness is not a nebulous fantasy; rather it is a tangible, reachable reality. Its composition continues to envelop women and to secure their loyalty as the original fragrance becomes the French women's preferred perfume1. Furthermore, around the world, it still holds its own among the top 4 women's global fragrances. Few months ago, Lancôme proposed a new olfactory vision of happiness with La vie est belle L'Eau de Toilette, a radiant variation of the original fragrance. A new success confirming the quest for happiness, this triumph of being over possessions or appearances, is utterly universal. And this fragrance's olfactory declaration – infused with grace and liberty – is truly multi-faceted. 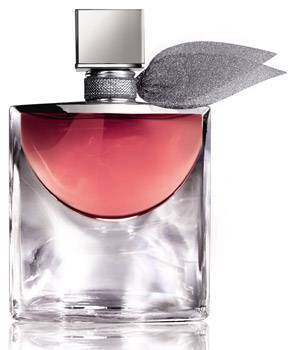 In order to perfect this luminous femininity all the more, Lancôme is writing a brand new chapter in the La vie est belle story. Today, La vie est belle L'Absolu de Parfum draws out the essential and takes it to sublime heights. Less but better. This quintessence of the original fragrance celebrates the truest expression of happiness. Thanks to the very same two leading perfumers, the initial iconic accord and Lancôme's first tasty iris, is given all-new beauty. Pared down, intensified and interwoven with sumptuous ingredients, it crafts a subtle balance between precious iris and exceptionally mouthwatering notes. Warm and enveloping in its intensity, the fragrance's aura amplifies every woman's sensuality, writing with them a new chapter of voluptuous moments infused with plenitude and absolute happiness." For the past two years, La vie est belle has echoed women's deepest desires. Mistresses of their own destiny, they understand that simply smiling at life and its possibilities constitutes the first step towards happiness. There is no greater joy than welcoming the beauty of a single moment. The desire to prolong that feeling of plenitude. La vie est belle, that exquisite invitation to aspire to happiness, to fulfil yourself on a personal level, to savour life with gusto, is now inherent in a brand new olfactory composition. La vie est belle L'Absolu de Parfum brings out the fragrance's very quintessence: more powerful, more sensual and as harmonious as ever, interwoven with sublime raw ingredients. The fragrance designers behind the first chapters of La vie est belle, Dominique Ropion and Anne Flipo, today take on a new challenge: returning to the essential of the original composition to render it all the more sublime. The very essence of Lancôme's iconic first tasty iris is transformed into an exceptionally concentrated absolu – one of the most potent in existence today. Pared-down luxury gives rise to pure intensity. This new expression of La vie est belle proclaims its delightful singularity, expressing its essence with even greater volume, opulence and sophistication. 'To create an absolu de parfum, you have to beautify the notes – especially the middle and base notes, so they become even more powerful, present and bewitching; all the time retaining the original fragrance's character", explains Anne Flipo. The gourmand and iris facets are amplified, reaching their true plenitude. Following the Haute-Parfumerie tradition, they grow more intense, present and bewitching whilst preserving the fragrance's original character. Characterised by their buttery and powdered root accents, incredibly textured notes of Iris Pallida (simultaneously concrete and irone), are heightened to the point of overdose, flourishing with unrivalled refinement. The famous gourmand accord, fuelled by tasty praline and colourful fruits like pear and blackcurrant, alongside the almond inflections of tonka bean, is transcended by a brand new vanilla pod accord. Lifted to majestic heights, joyfully infusing the fragrance with even more elegance, intensity and sensuality. 'Iris and the gourmand accord complement each other so well that, despite pushing them even further to create an absolu, their balance is naturally maintained. This perfect fusion of iris and mouthwatering notes, originally composed for L'Eau de Parfum, is now lifted to a new level for L'Absolu de Parfum. We are now offering the maximal quintessence of La vie est belle in a new version that's all the more powerful, while maintaining a perfect harmony," highlights Anne Flipo. The composition's oriental accord has been reworked, staying loyal to the prestigious codes of exceptional fragrance design. The essential heart of Patchouli, divested of its earthy facet to offer only its profound and addictive character, gives way to a new texture, caressed by soft, resin and amber-tinged notes of Cistus labdanum and warmed by Cashmeran wood's warm, vibrant and enveloping note. With its deliciously sweet, rounded and rich notes lifted by accents of balsam, tobacco, spice, smoke and leather, the vanilla pod accord simply adds to the fragrance's addictiveness. 'The Patchouli heart offers its profound, wooded notes. Its scent carries less camphor than the traditional essence and is more rounded and tobacco-tinged, with damp wood accents. The middle notes are achieved by fractionating Patchouli essence into smaller fractions, before selecting only the most interesting. This helps us to achieve a purer, clearer, warmer, woodier and thus more feminine result. It is not as dark as ordinary Patchouli yet maintains its moving and mysterious side," emphasises Dominique Ropion. The historic bottle designed in 1949 by Georges Delhomme for Lancôme founder Armand Petitjean emerges in renewed form thanks to Catherine Krunas, to embody the blossoming of a fragrance reaching the very height of its sophistication. The exceptional glass weight is justified by the phenomenal luxury of this new interpretation of the tasty iris. With all the sparkle of a jewel, it majestically reveals its precious cargo, 'The crystal smile," its vibrancy as if suspended at the heart of the glass. Its precious zamac cap, an accessory in its own right, resonates against the brilliant silver adorning the bottle's shoulders, the metallic tulle of its symbolic twin wings of freedom and the scintillating threads of its ribbon. Lastly, this exceptional bottle's shimmering metallic reflections magnify the carmine pink of this sublimely concentrated fragrance. Julia Robert's emblematic smile is a symbol of luminous femininity. We will soon see her in radiant form, headlining for Ryan Murphy's The Normal Heart, and expressing her commitment to powerful social causes with all of her signature authenticity. A woman of heart and mind, she embodies all of the different expressions of La vie est belle, reflecting women's accomplishments across the world.